Certainly! By now you must have seen the credit sequence for anime The Melancholy of Haruhi Suzumiya. Catchy, huh? No wonder the Wii Haruhi game is going to be a dancing game. 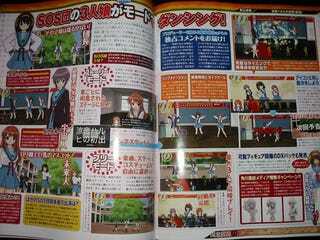 Well, not a straight up dancing game as it'll have a "Story Mode" (with dancing) and a "Free Mode" (with dancing). The game's about half done and slated for this year. Hum~ming! And yes, Haruhi dance after the jump.